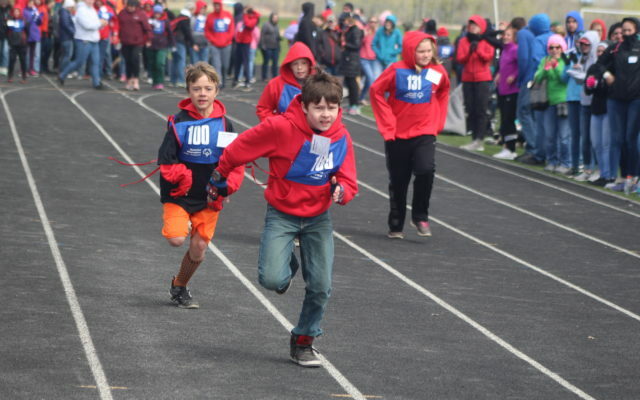 305 athletes gathered at the Presque Isle Middle School’s Johnson Athletic Complex Friday for the annual Aroostook County Special Olympics Spring Games. PRESQUE ISLE, Maine — Temperatures that hovered around 50 degrees and winds that gusted up to 20 miles per hour were no deterrent for the 305 athletes who gathered at the Presque Isle Middle School’s Johnson Athletic Complex Friday for the annual Aroostook County Special Olympics Spring Games. One of those athletes, Patrick McDougal of Work Opportunity Center in Presque Isle, was quick to downplay the effects of the cold weather. 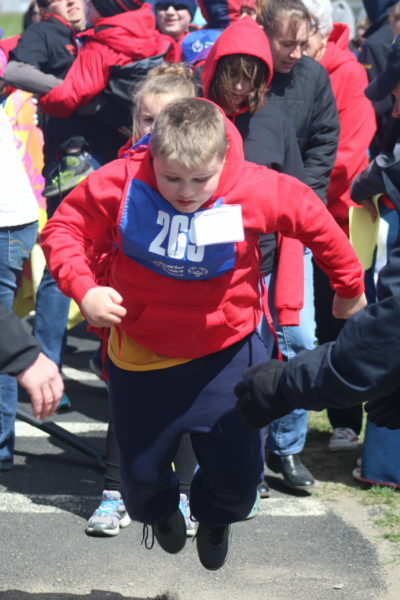 McDougal and his fellow Special Olympians competed in a number of track and field events, including the 50-meter run, the 100-meter walk, the 100-meter run, the 200-meter run, the standing long jump and the softball throw. Those bound to wheelchairs also were part of races. Brian Curry of Northern Aroostook Alternatives, based in Van Buren, was excited about doing the softball throw. “It’s my favorite because I have a good arm,” he said. Steve Richard, executive director of Central Aroostook Association, has been involved since the Spring Games were initiated 41 years ago and said there are two things that always stick out to him when attending. Both Richard and Michaud expressed the importance of volunteers. Between 150 and 200 were involved in Friday’s event, including several high school students from National Honor Society chapters throughout Aroostook. Ken Atcheson retired last fall from teaching and from his role as NHS advisor at Caribou High School, but still attended on Friday. He brought his students for 14 years and said it has always been an important learning tool. Senior Katelyn White was representing the Easton NHS chapter. The outgoing northern regional president of the organization said she and her fellow members like being involved. One of the other local organizations that volunteers is the Presque Isle Kiwanis Club. A. J. Cloukey began attending the spring games nearly 20 years ago with his father, Rene, and now as a Kiwanian himself, is part of a crew that oversees the softball throw competition. Law enforcement officials in the area are another huge presence. Members of the Maine State Police are in charge of the standing long jump, and have been since 1992. Cpl. Chuck Michaud of Troop F said he and his fellow officers love to stay involved. “When you see the athletes up close and personal, it puts in perspective what it means to them,” Michaud said. “They don’t really care about how far they jump, but it is often their interaction with us that keeps them coming back. MMG Insurance and WAGM-TV are local businesses that have had employees volunteer on an annual basis. U.S. Sen. Angus S. King paid a quick visit during his stop in Aroostook County and was able to present the MMG Sportsmanship Award to Holly Proulx of Northern Maine General’s Powell Memorial Center Day Program. 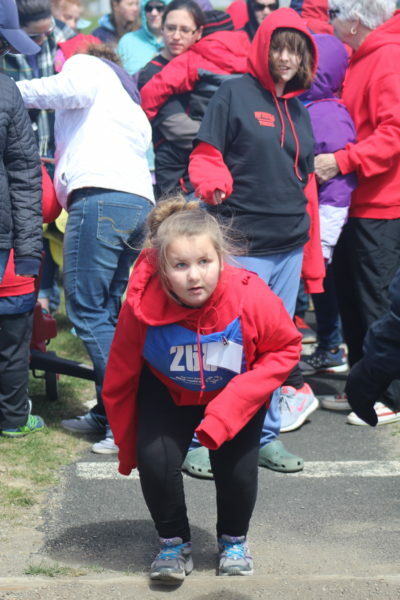 Winners at the Spring Games are eligible to compete at the Special Olympics Maine Summer Games, which will be held June 8-10 at the University of Maine at Orono. Top finishers there go on to compete at the nationals. The mission of Special Olympics Maine and Special Olympics Aroostook County is to provide year-round sports training and athletic competition in a variety of Olympic-type sports for children and adults with intellectual disabilities, giving them continuing opportunities to develop physical fitness, demonstrate courage, experience joy and participate in sharing of gifts, skills and friendship with their families, other Special Olympic athletes and the community.